These are the simplest design, which simply extract oil and gas (phase one) from water (phase two). 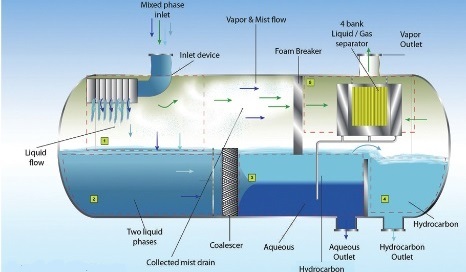 More advanced analysis is facilitated with a threephases separator, which divide oil (phase one), gas (phase two), and water (phase three). - Early production facilities and extended appraisal tests. - Dill stem testing operations. - Instrument air system package (including air compressors, air dryers and air receivers). Includes accommodations for operators and control cabin.